Rated Capacities Basket Hitch Based On D/d ratio of 25 time the component rope diameter. Rated Capacities Based on pin diameter no larger than natural eye width or less than the nominal sling. diameter Rated Capacities Based on design factor of 5 Horizontal sling angles less than 30 degrees shall not be used. These Choker Slings are used when maximum flexibility and ease of handling are essential for a sling which is to be attached to the load with a choker hitch. The extra flexibility of this type of sling permits the maximum frictional holding power between the sling and the load. faster handling. EXAMPLE: Fora single leg chokerwith a sliding choker hook with a rated capacity of 1.9 tons, 10 ft. long, used as illustrated: ORDER: One — 3/1 6″ size, Type 45-1-9, 10 ft. long. Rated capacities based on EIPS grade IWRC wire rope. 3/32 + 1/8 Utilize galvanized small cord minimum brake force. 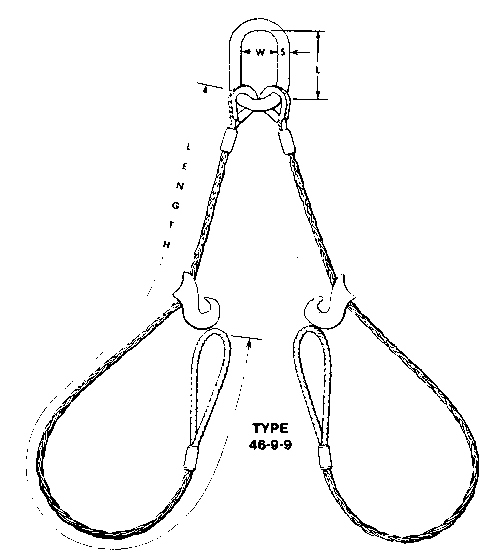 NOTE: Sling size is the diameter of the individual ropes in the sling. The above table is applicable to the three Choker Slings that are illustrated.